Place: Takatsuki Shiritsu Shogai Gakushu Center, 3rd Floor, Room 1. On December 2, 1938 the first refugees from the operation that would be known as Kindertransport arrived in Harwich, U.K.–196 children from a Jewish orphanage in Berlin that had been burned by the Nazis during Kristallnacht (‘Night of the Broken Glass’, November 9, 1938). The operation continued to bring Jewish children (including my father and his three brothers) to the UK until September 1939, just before World War II broke out. By that time, 10,000 children from Germany, Austria and Czechoslovakia had been ‘transported’ to Britain – but without permitting their Jewish families to accompany them. Meanwhile the clock was ticking for these families in Hitler’s Europe. The feel-good story about Britain’s beneficence to the Jewish children has its dark side, and the presenter believes that the time has arrived for a more critical approach to this famous episode of history. Using documentary clips, including interviews with the presenter’s own father, the presenter will explore how the children often suffered from intense cultural insensitivity, culture shock and trauma, as they were told to forget their religious practices, their mother tongues, and to eat, dream and breathe only in English. They were forced to cope with wrenching loss, isolation and issues of acculturation and assimilation . 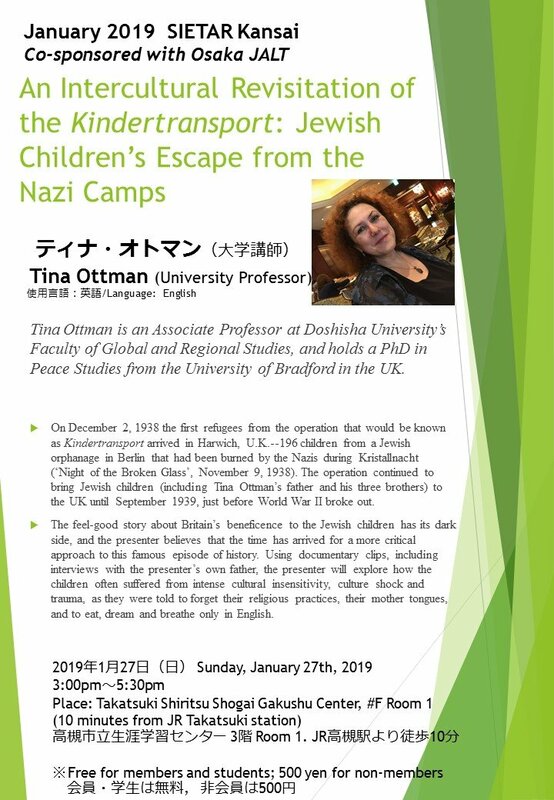 Tina Ottman is an Associate Professor at Doshisha University’s Faculty of Global and Regional Studies, and holds a PhD in Peace Studies from the University of Bradford in the UK. The daughter of a Kindertransport refugee, she arrived in Japan (where she has now lived longer than the lifetime of most of her students) via Israel/Palestine, where she lived and worked for some years.